Balochistan has an autonomous government, ruled by a Baloch nationalist. This line is often heard in response whenever someone complains about unjust treatment meted out to people of Balochistan. It is commonly believed that Balochistan government is all powerful and autonomous. In reality it’s just the opposite. Balochistan government cannot exercise the powers vested in it by the 18th Amendment to the Constitution of Pakistan. Security forces and federally controlled bureaucracy still call the shots in Balochistan and this is now an obvious fact. Babar Yaqoob Fateh Mohammad is the chief secretary of Balochistan. He belongs from the province of Punjab and holds the top bureaucratic post in Balochistan. He is the administrative head of Balochistan and he listens to no one. Provincial ministers of Balochistan can’t meet him because he doesn’t give them any importance. He only meets the Chief Minister (CM) of Balochistan but doesn’t obey all the orders of CM. In September last year, a devastating earthquake hit Awaran district of Balochistan. The earthquake killed approximately 1000 people and displaced thousands of others. Due to security dynamics of the district, local relief organizations were not able to effectively help the earthquake victims. CM Balochistan asked international relief organizations for help and when they came to Balochistan, Chief Secretary flatly refused to issue NOC to them. Thus Chief Secretary effectively torpedoed the attempts of the CM to get international help for the earthquake victims. Moreover, Chief Secretary Balochistan is present in every official meeting and functions alongside the CM. In rest of the three provinces Chief Secretaries are in low profile and never seen in official functions side by side the CMs. The Balochistan Chief Secretary’s image at official functions is that of Deputy CM. In the presence of such dominating Chief Secretary, provincial autonomy can only be a delusion. Chief Secretary is appointed by the prime minister and only he can sack him or transfer him. 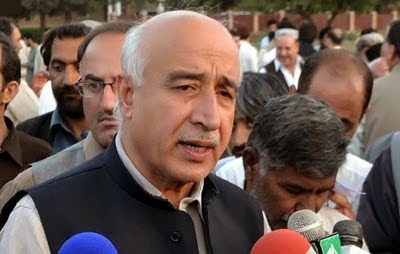 CM Balochistan is helpless if Chief Secretary refuses to obey his instructions like the Earthquake relief case. Secretaries of provincial ministries of Balochistan can’t be transferred without the approval of the Chief Secretary and if a secretary has the blessings of the Chief Secretary then he becomes more powerful than the provincial minister of that department. Recently, Rehmat Baloch, who is Minister of Health closed his office in protest of Secretary Health who doesn’t obey his orders. Rehmat Baloch who has been given the charge of Health department by the Balochistan government is powerless because the secretary of his department doesn’t obey him. There is nothing that Rehmat Baloch can do about it and even CM Balochistan is helpless if Chief Secretary sides with the Health Secretary. Rehmat Baloch is the first minister who has gone public about his helplessness and there may be several other ministers who are suffering similar problems. In some cases, Deputy Commissioners don’t obey the provincial ministers and the MPAs. Sarfraz Bugti, who is Minster for Home and Tribal Affairs, complained that a certain Deputy Commissioner doesn’t consult him before making decisions about the district from where he was elected. There are however some secretaries and Deputy Commissioners who do obey the provincial government but even if one of them doesn’t then the provincial autonomy is nothing but a farce. The attitude of the federal government is apparent and it is not a secret that it doesn’t give what Balochistan government asks from it. CM Balochistan has complained about the attitude of NHA officials and termed it Anti-Balochistan. Neither the WAPDA nor SSGC officials solved the problems relating to Balochistan as they had promised to CM. Just last month, parliamentarians belonging from Balochistan protested outside the National Assembly for the worsening law and order situation in general and for recovery of abducted tribal Chief Abdul Zahir Kasi in particular. The relationship between Balochistan and Federal government is underscored by empty promises and false assurances. Likewise, Balochistan is getting less water than its agreed share according to the rules of Indus River System Authority. Same is the case with gas because 18th Amendment gives the owner of a natural resource the first right to use of that resource. The situation of electricity is not much good either; the two transmission lines that were supposed to be completed in 2011 are still incomplete. Now, if Pakistan produces surplus electricity, load shedding will not end in Balochistan because of the poor strength of electric grid infrastructure which can transmit only half the electricity that is required in Balochistan. The gas royalty surcharge paid to Balochistan for per British Thermal Unit is Rs. 47, whereas Sindh and Punjab receive Rs. 222 for the same unit. The post-independence history of Balochistan is marred with One-Unit, military operations, unjust dismissals of provincial government and empty promises. In the last 66 years, federal government has always failed to treat the Balochistan in the way as prescribed by the Constitution of Pakistan. The attitude of federally appointed Chief Secretary speaks volumes about how Balochistan is being treated. The bureaucrats at Islamabad are particular unfriendly to Balochistan and they block any attempt which empowers the Balochistan government. In this modern era a country can only progress if its constituent units are completely empowered. The centralized state is an after-thought in this era and Pakistan government should adapt according to the needs of the time. Development and progress in Pakistan will be a mere dream if smaller provinces and Balochistan are not given autonomy in its true essence as per the constitution.